Welcome, friends. Today is part two of GOALS & GRACE. 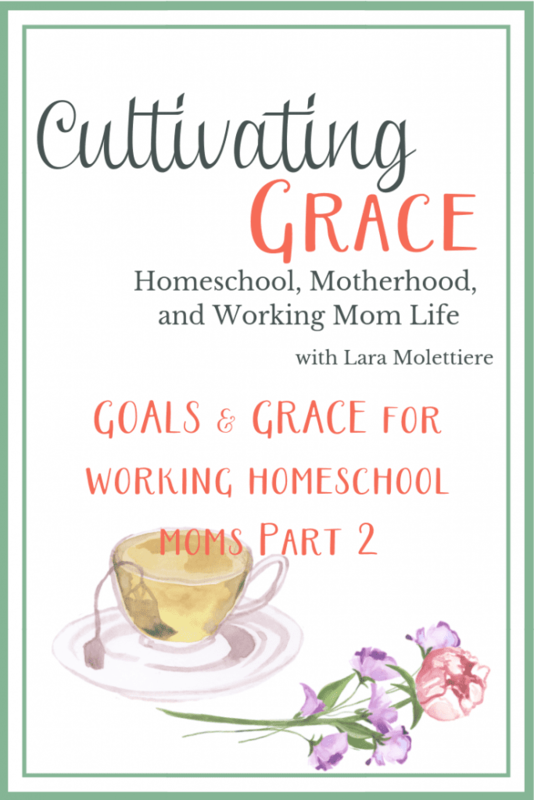 Today, we are going to be talking about grace as a working homeschool mom. Grace is your permission slip to dream big, to love bigger, and to delight in attending of a life well lived, even through the dirt of messing up, failure, and straying from your goals. The great big G in GRACE stands for God is already ahead of you. There is no misstep in your business, or your homeschool, or your life that He doesn’t already know is coming. There is no success in your business, or your homeschool, or your life that He hasn’t already planned. You have to rest in the promise that God is going to be singing over you, over your homeschool, and over your business. You’re going to mess up, but you have to be brave anyway. “In order to achieve anything, you must be brave enough to fail,”- Kirk Douglas. You have to be willing to take chances. Failure is a learning tool that God uses to teach us all kinds of amazing lessons. The R in GRACE stands for reach high. You have to be willing to have God-sized dreams. If your goals don’t scare you or make you afraid to fail, then you’re not dreaming big enough. You need to take the phrase, “I’ll never” out of your vocabulary. Playing small in your business or your homeschool does not serve the world. God has big plans for all of us if we allow Him to work through us. A stands for anticipate adventure. There are so many wonderful ways that we get to adventure in this homeschooling life. Be prepared for days when your schedule is interrupted. Be prepared to burn out from time to time because it happens. It doesn’t matter if it’s your business or your homeschool. Sometimes, we just hit a point where we need to rest. Be willing to try new things and ideas and allow for time to explore in your business and your homeschool. Don’t be afraid to learn new things. There are so many incredible opportunities and so many different ways to do things. There’s nothing wrong with trying a new one. Sometimes, it works great. Other times, it may not. Sometimes, a curriculum helps. Sometimes, it hinders. We have to be willing to take those risks, so that we can move forward. The C in GRACE is for cultivate life. Be willing to grow good things. Grow your faith. Grow your relationship with your children. Grow your relationship with your clients. Grow your quiet time. Grow community. Grow the margin you make for rest. Grow your homeschool through diligence. Grow your business with integrity. All these things that we are growing and cultivating are moving us towards our goals. There’s nothing wrong with making a mess! We all do and it’s how we learn and grow. Don’t be afraid to get some dirt under those nails. Thank you so much, friend, for joining us as we’ve gone through a brief overview of Goals and Grace. I hope you’ve found these tips helpful. If you missed part 1 about GOALS, you can find that here.